A health worker is sprayed with disinfectant after working in an Ebola treatment center in Beni, Eastern Congo. 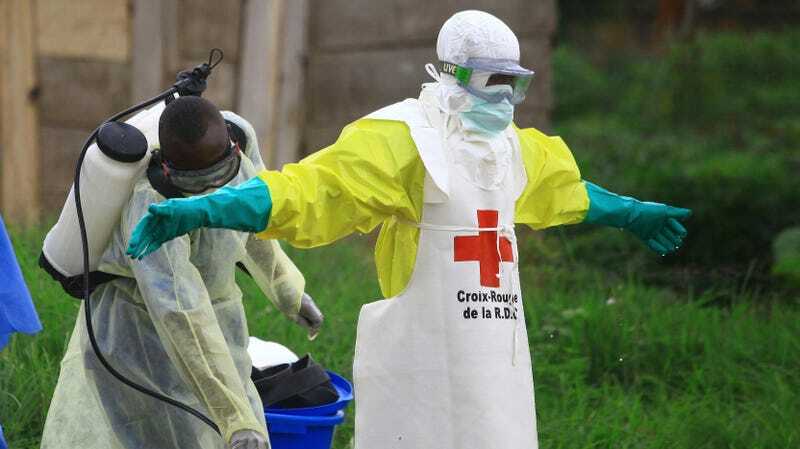 The outbreak so far is centered around the northeast of the DRC, in the regions of North Kivu and Ituri. It seemed poised to die down last fall, but a second wave of cases dashed that hope, and the number of new victims once again surged in January. Between January 15 and February 3, the World Health Organization reported last week, there were 123 new confirmed cases alone. The current toll represents the second largest outbreak of Ebola in recorded history, thankfully still far behind the 2014-2016 outbreak in West Africa that sickened nearly 30,000 people and killed over 11,000. On Sunday, the nonprofit Save the Children highlighted the young victims of the current outbreak. According to the organization, there have been 97 children killed so far, with the majority under the age of five. The violence and conflict in the DRC has steadily hampered efforts by health workers to track possible victims, isolate the infected, and vaccinate those in close contact. The U.S. has also blamed its removal of Ebola experts from the area on the violence, though experts and organizations elsewhere have sharply criticized the country for doing so. Many of the U.S. scientists pulled from the area, critics have noted, have decades of expertise in managing previous Ebola outbreaks. According to the Health Ministry of the DRC, nearly 80,000 people have been vaccinated with an experimental vaccine manufactured by Merck. And though official data on the vaccine’s efficacy is still not available, WHO experts believe it’s been highly effective (90 percent or higher). The WHO also expects that the currently available supply of vaccine will be enough to outlast the outbreak. So far, the fear that Ebola would spread to neighboring countries like Uganda hasn’t come to pass, either. In the U.S., two people were being monitored for possible Ebola exposure in hospitals in Pennsylvania and Nebraska, including a health worker who provided aid in the DRC. Both patients have now been cleared and sent home.